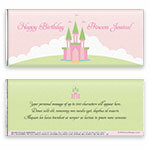 Celebrate with royal style - this delightful wrapper showcases the perfect castle for your little princess! Design: Fairytale princess castle with shades of pink and green. Personalization: Front greeting and name, back message.